Sampath Bank was awarded and recognized as one of Sri Lanka’s 10 Most Admired Companies at the “Most Admired Companies of Sri Lanka 2018” awards ceremony held under the auspices of Hon. Ranil Wickremesinghe, Prime Minister of Sri Lanka, at the Shangri-La Hotel, Colombo recently. Organized by the International Chamber of Commerce, Sri Lanka (ICCSL) and the Chartered Institute of Management Accountants (CIMA) Sri Lanka in partnership with AIA Insurance Lanka, Aon Hewitt India, Daily FT and KPMG, the awards sought to recognize companies that have demonstrated outstanding financial performance as well as strong corporate reputation over the years. Sampath Bank was one of 180 companies that were identified as most admired by employees, competitors, and other stakeholders through a public survey carried out via Dialog. The Bank was chosen for the Top 10 from amongst them by a pre-eminent panel of judges headed by Mr. Ravi Abeysuriya, CFA, FCMA, CGMA, through a rigorous selection and interview process based on 8 financial and 7 qualitative criteria. 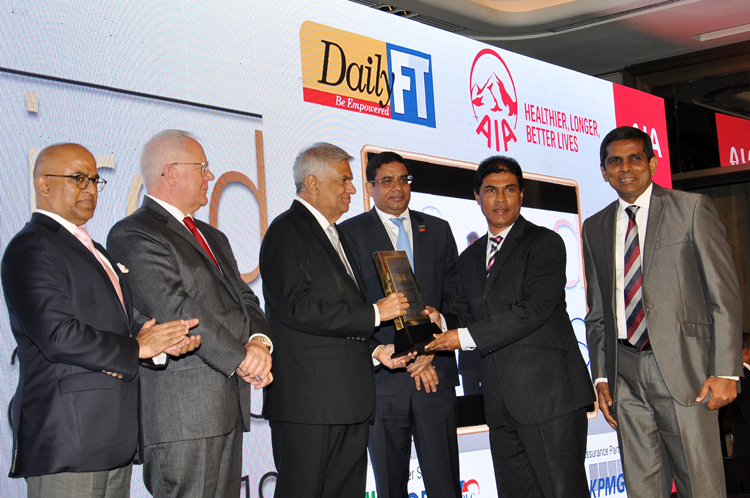 The list of Sri Lanka’s 10 Most Admired Companies comprised of some of the country’s largest diversified conglomerates and financial service providers as well as players from the tea and ICT sectors. This honor comes on the heels of Sampath Bank being recognized as Sri Lanka’s ‘Best Retail Bank’ and ‘Best Commercial Bank’ for the 5th consecutive year at the prestigious World Finance Banking Awards. Earlier this year, the Bank was included to the MSCI Frontier Market 100 Index, becoming the only Sri Lankan company in the Index with a weightage of 0.36%. Mr. Tharaka Ranwala, Senior Deputy General Manager – Consumer Banking, Sampath Bank PLC and Mr. Aruna Jayasekara, Group Chief Human Resource Officer, Sampath Bank PLC accepted the award on behalf of the Bank at the event in the presence of leaders from the government and the private sector. Caption - Mr. Tharaka Ranwala, Senior Deputy General Manager – Consumer Banking, Sampath Bank PLC accepting the award from Hon. Ranil Wickremesinghe, Prime Minister of Sri Lanka in the presence of Mr. Aruna Jayasekara, Group Chief Human Resource Officer, Sampath Bank PLC (extreme right) and other dignitaries.